Client: Brabners Chaffe Street, Solicitors, acting for Edinburgh Woolen Mill Limited. 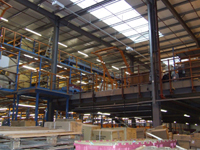 In late 2007 we were instructed by Brabners Chaffe Street, Solicitors acting for Edinburgh Woollen Mill Limited, to investigate leaks through the roof of an extension to their Distributions Warehouse, near Carlisle which was constructed in 2002 and is occupied on a 25 year fully-repairing lease. We were asked to provide an Opinion upon the causes of water penetration, which had persisted since the extension was first occupied in 2002. We studied contract documentation and drawings, relevant technical data current at the time the extension was roofed, and we checked the accuracy of the steel frame, which supports the roof cladding. The extension was built by Alfred McAlpine Capital Projects Limited who engaged a roofing sub-contractor (T.A. Kirkpatrick) to provide and install the roof cladding, including four barrel-vault roof lights. There had been numerous leaks since the extension was built and these had continued despite various attempts by the builder to provide a waterproof roof. During the course of our investigations we were able to study drawings prepared by various parties involved in the design and construction of the project including Cumbria Design Services, Capita Property Consulting, and Bingham Yates & Partners. 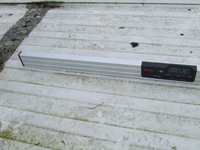 We were also provided with various Specifications, and extracts of product literature for insulated roof panel systems produced by Kingspan Limited. From that information we were able to determine that the original drawings and specification intended roof steelwork to be installed at 4° minimum pitch to suit the requirements of the factory made trapezoidal roofing panels produced in continuous 22.4m lengths by Messrs Kingspan. 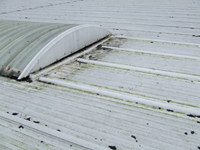 We undertook a survey and investigation during a period of inclement weather, and noted 90 leak locations causing staining to the interior, with leaks occurring beneath roof lights and beneath joists between roof panels. We took over 40 readings of the inclination of the steelwork and a corresponding number for the pitch of the roof panels to discover the average angle of inclination. This was 1.5°! Externally we noted the roof cladding in one area was not the specified material and was not formed in continuous lengths from eaves to ridge, as required by the Specification. We noted numerous ad-hoc attempts made to seal various joints, with the addition of cover-slips at joints and polysulphide mastics. And, the roof lights had not been provided with upstands, making it impossible effectively to waterproof junctions at joints. 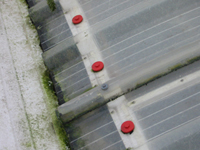 Further inspections revealed a considerable quantity of organic material (moss and lichen) on the roof, contributing to the failure of the roof to drain freely. Our Report confirmed the roof was not weatherproof; that water penetrating the roof was damaging the thermal insulation and the internal flooring; that the roof covering and the supporting steelwork had been defectively designed in that they failed to take account of construction tolerances and deflection in the roof panels; and that, under normal conditions, the roof surface was, for all practical purposes, flat. Hence, in the absence of an adequate self draining fall, water was being retained on the roof and subsequently penetrated the joints in the cladding system. We concluded water penetration was a foreseeable consequence of the inadequate slope to the structural steel frame, coupled with the use of a roof cladding system not recommended for application to the minimal slope provided by the supporting steel frame and purlins. Before entering into a fully-repairing lease have the roof inspected by a suitably experienced roofing specialist. We can provide that service for property owners considering a purchase. Below: photographs of the interior; the roof light with no upstands; surveying the roof incline; and, organic material contributing to the failure of the roof.